Brain Exercises can be defined as the extent to which your brain is kept in good mental condition. It can prevent memory loss. Brain fitness is just not the absence of brain disease. It really means the extent to which your brain is good health. In a sense we are talking about the state of wellness of your brain. The latest research is indicating that not only can memory loss be prevented in our senior citizens; memory can also be improved in younger people by exercising the brain. In a study at the University of Illinois in 2006, physical exercise was shown to improve brain functioning on tests which measured the person’s ability to respond quickly and multi-task when presented with problems. Exercise promoted better brain functioning and less memory loss in both older and younger participants in the study. So… exercise is very important for your muscles and heart as well as your brain. As we get older our brains begin to age and our brain structures begin to change. Your brain communicates through wires called axons between brain cells called neurons. As you begin to age or if your are less fit, these communication pathways begin to slow and mental sharpness can decline. This can begin as early as age 40 for most people. Brain exercises can help preserve your brain tremendously. What can be done other than physical exercise? Well good nutrition is very important as you can see on another section of Memory-Loss-Facts.com. But many people are finding that brain fitness can be improved through Neuroplasticity, a type of brain exercise. This word refers to the brain's ability to rearrange itself by making new connections throughout life. Neuroplasticity allows nerve cells (neurons) in the brain to compensate for injury or disease. Brain fitness training can also make it easier for the brain to turn on circuits that improve a person’s compassion and empathy. Some research even has pointed to the positive benefits of meditation in improving brain functioning. This research points to the power of meditation in improving the circuits in the front part of the brain (frontal lobes) that regulate your emotional brain (amygdala). 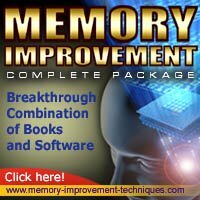 NOW… we have computer Brain Training Software that is available on the internet that can improve the person's memory, reaction time, attention, speed of mental processing and even decision making involving operation of motor vehicle. Some studies have shown reduction of at-fault risk of motor vehicle accidents by fifty percent (50%).